"From October 1951 to November 1956, the skies of Central Europe were filled with more than 350,000 balloons carrying over 300,000,000 leaflets, posters, books, and other printed matter that were sent from West Germany over the Iron Curtain to Poland, Czechoslovakia, and Hungary. This paper ... trace[s] the reasons for this balloon saturation." Clark comment: This paper includes an excellent, brief outline of the beginning of the Free Europe Committee and Radio Free Europe. 2. "Balloons Over East Europe: America's Covert Radio and Leaflet Operations in the Cold War." Falling Leaf: The Quarterly Journal of the PsyWar Society 197 (Summer 2008). This is an updated version of the above with some new information and a new title. This article "look[s] at 'The Winds of Freedom', the first balloon-leaflet operation, and its effect on the 1951 Crusade for Freedom campaign in the United States." This article updates the one above with new information. Cummings, Richard H. "Carlos the Jackal and the Bombing of Radio Free Europe/Radio Liberty in Munich." Intelligencer 16, no. 1 (Spring 2008): 41-52. From author: "The article details how the East European Intelligence Services, especially those of East Germany, Hungary, and Romania, supported and protected the infamous terrorist known as 'Carlos the Jackal' and his group of pan-European terrorists with arms, money and safe havens from 1979 to 1986. Starting in the summer 1980, Carlos cooperated with the Romanian foreign intelligence service, culminating with the February 1981 bombing of Radio Free Europe/Radio Liberty headquarters building in Munich. The article then examines the negative reactions of the Soviet Union and Warsaw Pact countries, especially Hungary, to the bombing, which forced Carlos to leave his base in East Europe. The myth of 'Carlos the Jackal' is further exposed, when the author includes excerpts from previously unpublished correspondence between Carlos and his right-hand man Johannes Weinrich as well as from top-secret documents from the archives of the Romanian and Hungarian intelligence services." 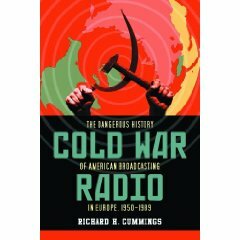 Cummings, Richard H. Cold War Radio: The Dangerous History of American Broadcasting in Europe, 1950-1989. Jefferson, NC: McFarland, 2009. Clark comment: The author was Director of Security for Radio Free Europe/Radio Liberty for 15 years beginning in 1980. From publisher: "During the Cold War, Radio Free Europe and Radio Liberty broadcast uncensored news and commentary to people living in communist nations. As critical elements of the CIA's early covert activities against communist regimes in Eastern Europe, the Munich-based stations drew a large audience despite efforts to jam the broadcasts and ban citizens from listening to them. This history of the stations in the Cold War era reveals the perils their staff faced from the Soviet Union, Bulgaria, Romania and other communist states. It recounts in detail the murder of writer Georgi Markov, the 1981 bombing of the stations by 'Carlos the Jackal,' infiltration by KGB agent Oleg Tumanov and other events. Appendices include security reports, letters between Carlos the Jackal and German terrorist Johannes Weinrich and other documents, many of which have never been published." Peake, Studies 54.2 (Jun. 2010) and Intelligencer 18.1 (Fall-Winter 2010), notes that Cummings focuses "on security and intelligence issues that were a direct consequence of the policy to use émigrés to broadcast information to and about nations behind the iron curtain.... Cold War Radio is well documented and leaves no doubt about the value of the radios to the citizens of communist nations to which it broadcast.... This is a valuable contribution to the literature." For Mardling, historytimes.com, 9 Jul. 2009, this book deserves the attention of "anyone with even the slightest interest in the machinery of the Cold War." Cummings, Richard H. "Covert Broadcasting During the Cold War." Intelligencer 10, no. 3 (Dec. 1999): 15-17. This is an excellent, brief introduction to the origins of RFE and RL. "Abstract: This article traces hostile intelligence service activity, ranging from espionage to murder, from the Warsaw Pact countries directed against exiles working for the American sponsored radio stations Radio Free Europe and Radio Liberty in Munich, Germany, 1950-89." "This article ... partially lift[s] the veil of 50 years of secrecy surrounding the origins of the American covert psychological war waged in Germany. Radio Free Europe was set up as a private organization with the political support of United States Department of State and leading American foreign policy experts, and with the covert financial support of the U.S. Central Intelligence Agency.... This article also details one successful American covert psychological operation that took place from October 1951 to November 1956, when the skies of Central Europe were filled with more than 350,000 balloons carrying over 300,000,000 leaflets, posters, books, and other printed matter that were launched in Germany and dropped behind the Iron Curtain." Cummings, Richard H. "The Last Tango in Munich: Carlos and the Bombing of RFE/RL." Midcoast World News Exchange. http://www.midcoastexchange.com. Deals with the bomb attack by Carlos' (Ilyich Ramirez-Sanchez) pan-European terrorist group on Radio Free Europe/Radio Liberty on 21 February 1981. The author notes that "[m]ost of the information for this article comes from the files of the ... 'Stasi.' I reviewed some of the relevant Stasi files as a result of the German government's investigation into the bombing of RFE/RL; other Stasi files have been selectively released to the media over the years." Cummings, Richard H. "Mirror in the Wilderness: Myths and Facts Surrounding the Role of Radio Free Europe during the 1956 Hungarian Revolution." Intelligencer 15, no. 3 (Summer-Fall 2007): 43-51. I am always glad to see a contribution on RFE from Richard H. Cummings, as he is one of the few who makes the effort to remind us of the contribution of RFE (and, by extension, RL) to the Cold War. Here, he revisits earlier material on the development of RFE and, then, provides some interesting (and, perhaps, new) insights to the relationship between RFE and the Hungarian Revolution. 1. "The Murder of Georgi Markov." Intelligencer 10, no. 1 (Feb. 1999): 9-11. Georgi Markov was a Bulgarian expatriate writer and journalist who was assassinated in London in 1978 by Bulgarain and/or Soviet intelligence services. A coroner's inquest ruled that he was "killed by the use of a poison called ricin." The relevant files in Bulgaria were apparently destroyed in 1991. Georgi Markov was murdered in September 1978. He had defected to the West in 1969 and worked as a broadcast journalist for Radio Free Europe, the BBC, and Deutsche Welle. "A former KGB general has publicly admitted his role and the role of the KGB in supplying the Bulgarian intelligence service with both the weapon and the poison" that killed Markov. After "years of official investigation, no one has been charged with the crime. The dots have not been completely connected. The final piece of the puzzle to complete the picture remains to be found." 3. "Ultimate Censorship: The Murder of Bulgarian Writer Georgi Markov." Intelligencer 17, no. 3 (Winter-Spring 2010): 23-27. Updates the 1999 article (above). 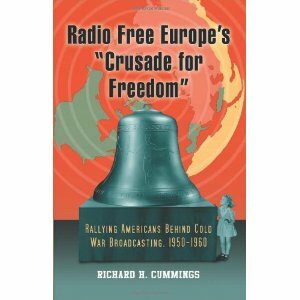 Cummings, Richard H. Radio Free Europe's "Crusade for Freedom": Rallying Americans Behind Cold War Broadcasting, 1950-1960. Jefferson, NC: McFarland, 2010. Clark, IJI&C 24.4 (Winter 2011-2012): Even though it details an expansive Cold War propaganda effort directed at the American people by the U.S. government, this work "takes us back to a bygone era when individuals great and small could come together in a purposeful, national, public-private endeavor." Peake, Studies 55.2 (Jun. 2011), says that this work "is well documented and contains a useful chronology of major events."